In 1277, King Edward I ordered the construction of several defensive castles in Wales to defend the English and keep the Welsh out. There were 4 castles built in Flint, Rhuddlan, Builth, and Aberystwyth. All 4 castles are still standing today and open to the public. Rhuddlan and Aberystwyth Castles were innovatively designed with ringed defensed, walls-within-walls. This was a very innovative design as it enabled guards to defend their position from several heights avoiding the danger of firing upon their own men.The welsh briefly took the castle from the English In 1404 under the leadership of Owain Glyndwr but was recaptured until being recaptured by cannon in 1408. Unfortunately Aberystwyth Castle is now a ruin and you can only imagine what it would have been like when fully intact. All that remains now are the inner and middle wall of the castle. Unfortunately the castle was blown up in 1649 and the castle stones were used as building material for other buildings. In 1916 to commemorate the Eistedford 13 bardic stones were erected to represent each pre-1974 counties. In 1923 a beautiful war memorial was erected in front of the castle right on the sea front. 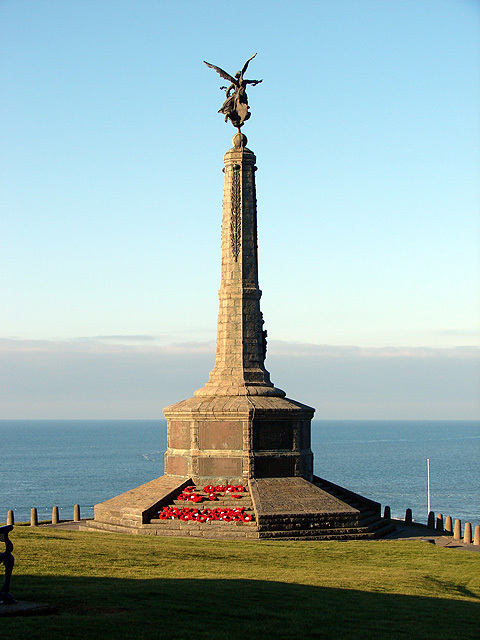 The Aberystwyth town war memorial is arguably be one of the finest in Britain. Recorded on it are the 111 men from Aberystwyth who died during the First World war and the 78 men and women who died during the Second World War.